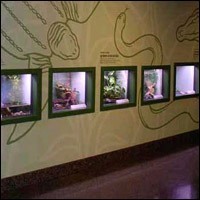 Fernbank Science Center, where science becomes an adventure, is operated by DeKalb County School System. It's a perennial favorite for family outings to the Jim Cherry Planetarium (the largest in the Southeast), the Ralph Buice Observatory, its garden area, and an exhibit hall featuring live animals, a world-class meteorite collection, and the Apollo 6 capsule. Admission is charged for planetarium shows and some special events, but the exhibit hall and garden areas are free for all to enjoy.